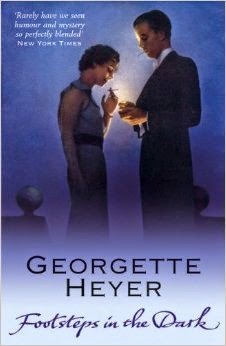 I first heard of Georgette Heyer in my first year of university, but wholly in terms of her work in Regency romance. So when I was browsing a second-hand book stall and found Footsteps in the Dark, I was somewhat confused to find that she also wrote detective fiction. So, being fond of the genre, I decided to pick it up and see if her writing deserved her good reputation. Footsteps in the Dark follows a family made up of siblings Celia, Peter and Margaret, as well as Celia's husband Charles, as they move into an old priory that they have recently inherited from their late uncle. Intent on a relaxing summer away from the city, they find themselves almost overwhelmed with local stories of the ghost that supposedly haunts their new home. Stories are easy enough to ignore, but when strange things start to happen around the priory it is enough to prompt investigation. But their investigation brings about increasingly extreme events, until someone inevitably dies. This is an example of how blurbs can be misleading. In the blurb, the murder that occurs is given quite a bit of emphasis, despite the fact that it doesn't actually happen until over halfway through. The emphasis throughout the majority of the novel, even after the murder, is that of who is trying to scare this family from their home and for what reason. It puts a slightly different spin on things. I went into the novel, expecting a murder mystery tempered by some very gentile aristocratic society. What I got was gentile aristocratic society tempered by a little bit of murder. It felt maybe too gentle as a result. Certainly not the fault of the book itself, but I feel that more realistic expectations wouldn't have gone amiss. As it was, I felt kind of disappointed, if only because it was less a matter of sifting through various delicious scandals and more trying to figure out who has the most unexplained absences. It's not a bad book by any means, the cosy detective popcorn book at its best, but it's not what was advertised and suffered for it. For people looking for a gentle read with some mild humour and a decent amount of adventure towards the end, then this is perfect.